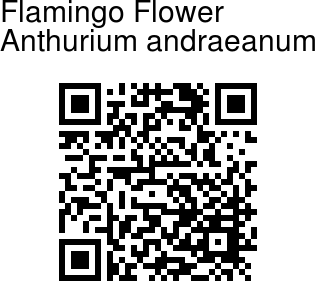 Anthurium, pronounced an-THOO-ree-um, are once-seen, never-forgotten flowers. Their unmistakable glossy heart-shaped bright red flower bract (which gives them their popular name of painter's palette) surrounds the true flowers, which are in the form of a spike (or spathe) at the centre. Anthuriums come in shades of reds, pinks, white, lilac, green and chocolate brown. A tropical perennial herb growing up to 20" tall; it has dark green heart-shaped leathery leaves and a green stem. The seeds are small subglobose berries. The flower bracts have a puckered appearance and shine as though they were varnished. 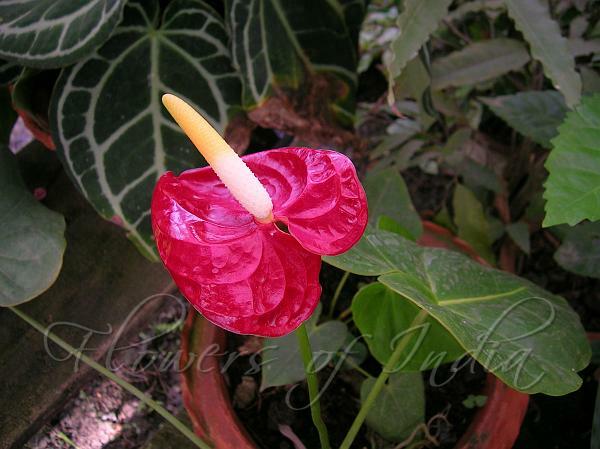 Anthuriums will bloom more or less continuously, each plant having four to six flowers during the year. Each flower will last about six weeks on the plant or several weeks when cut and placed in a vase of water.